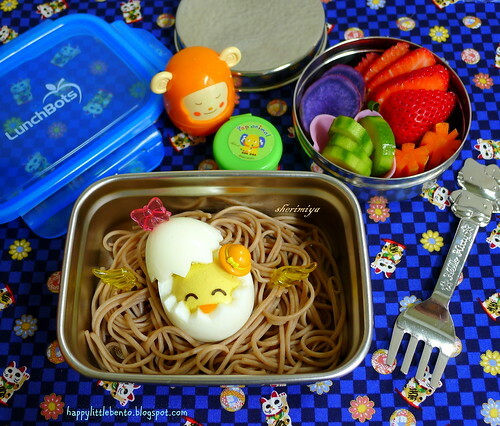 Easter Chick Soba Bento, a photo by sherimiya ♥ on Flickr. I squeezed in one last Easter theme bento: a little chickie atop a soba nest. Actually, this is a hen's egg, so it's a pretty big chick, but all the better to see his little face. Quail eggs are easier to cut, but I managed to get the "eggshell" off this one pretty much intact after a lot of finagling. The containers hold soba tsuyu and furikake for TinySprite to add to her soba at lunchtime. The LunchBots Clicks is perfect for this because it's totally leakproof; if she doesn't finish it all, it won't spill out into her lunch tote afterwards. The EcoLunchBoxes Ecodipper was a nice-sized accompaniment to hold her strawberry, Moloka'i Okinawan sweet potato, house-pickled cucumbers and carrots. I won't see you until next week, so enjoy your weekends! Happy Easter, happy Passover, or happy egg hunting! Oh no... I hope you can find replacements for your favorites. Ohmigosh.. this really is too cute! I especially dig that lil' hat on the chick!